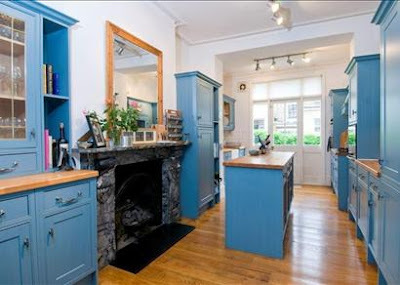 The fireplace stands out in this blue kitchen in a Notting Hill home that was for sale last year. If it was lit I think it would give a better sense of its impact in the room. I agree! I would love to have a fireplace in the kitchen. (and a couch) So people could get nice and cozy! I say YES to as many fireplaces as possible. except maybe a kids' room. If I had a fireplace in the bedroom I might never use my central heat. they just don't build houses like that anymore, do they? PS, that Accents photo is from Mark Maresca's Charleston house (I can see you loving his work!) and the photog is William Waldron. The absolute ultimate luxury, followed of course by fireplaces in the bath. I am not sure if you can ever have enough fireplaces in a house. Perhaps that is one of my reasons for being drawn to older houses - they tend to have multiple fireplaces. A fireplace in the kitchen would be heaven. That blue! How brave-would love to paint my kitchen cabinets such a fun color! i could live in any one of those rooms. literally. just me and my snuggie and i'd be set. haha jk. We've got a corner fireplace in the kitchen (actually ten throughout the house). Like all of ours, it doesn't work. It had a coal grate and an unlined chimney. And it was concreted in... . If I had the thousands that it would take to restore them all, I'd do it in a heartbeat. Send winning lottery tix my way please. oh, that would be a dream. there is an inn i stay at in england with a great inglenook fireplace in the kitchen. built in 1350 there are many slashes on the stone sides, especially on the right side. the innkeeper said it is where swords were sharpened and since most people are right handed the right side was deeply gouged....divine! Beauty and function! 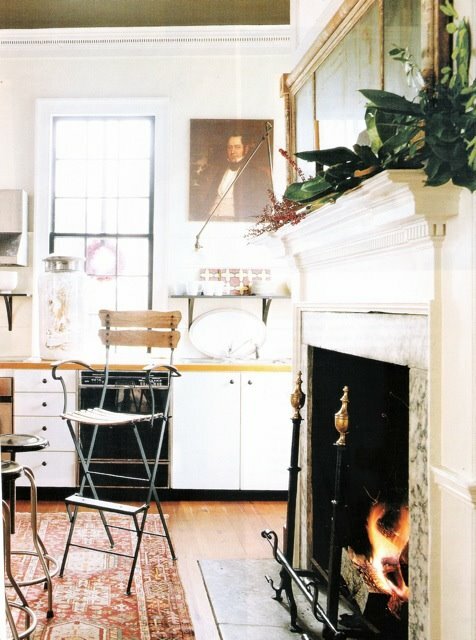 Ah, to have a fireplace and cozy chair in the kitchen--heaven! Charming and I would love one. Hi Michele! We love our fireplace in the kitchen at Garvinweasel, you can see it here. Michele! I swear that I just added this to my dream home list after falling in love with the same Southern Accents pic. It's one of my favorite kitchens of all times. 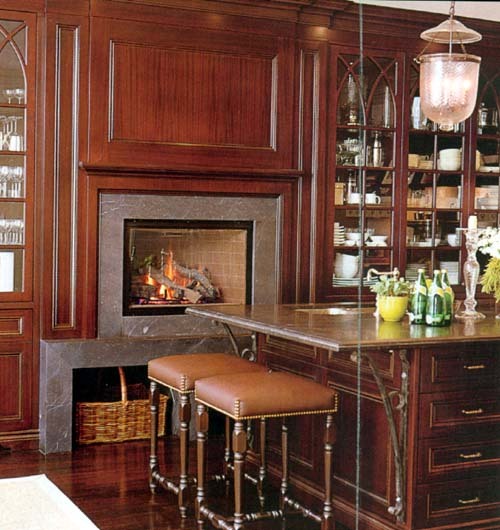 Love fireplaces in the kitchen. And in the dining room, living room, bedroom . . . The more, the cheerier. I am adding on a conservatory type room to put a large kitchen table. It will have large floor to ceiling windows and and french doors. In the middle I am placing a fireplace that will sit up higher so you can see it over our table. I don't want it to look like it's floating. Got any ideas. To have a fireplace in the kitchen would be magnificent, it would just make the room a lot more comfortable and cosy! I've had my eye on this white marble fireplace but we still need to save up some more money for it. Fingers crossed we'll have it in by the end of the year!